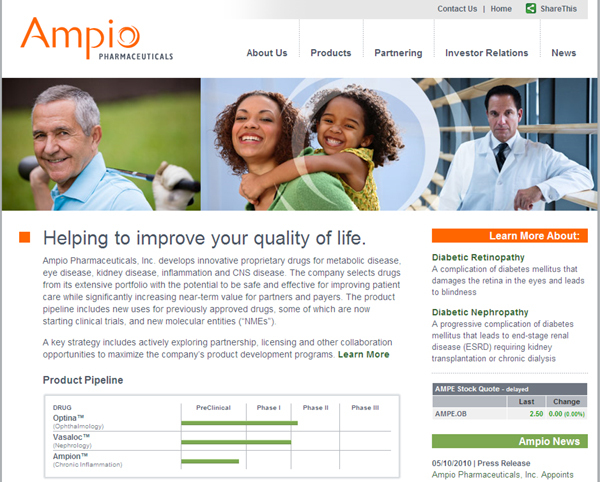 Workbox is extremely pleased to announce the relaunch of Ampio Pharmaceutical’s corporate website – http://www.ampiopharma.com. This website replaces the temporary site we launched a few months ago – that website acted as a placeholder while branding, design and content was being refined. We think online marketing professionals will be interested our choice of content management systems: WordPress. You really can’t tell whether this site’s content is managed with WordPress or any other CMS. That’s because we can create amazing designs and customize the administrative interface, while keeping all of WordPress’s built-in features and maintaining access to the amazing abundance of plugins. This isn’t WordPress out-of-the box, but it isn’t on steroids, either. It’s just efficiently customized to meet Ampio’s online marketing needs – and it will keep costs in check as the site evolves to keep up with Ampio’s rapid growth. Of course, we think the product pipeline and the stock ticker is pretty nifty, too. Please let us know if we can help in any way with your online projects. From Russia With HTML: Any Femme Fatale Spies At Workbox?